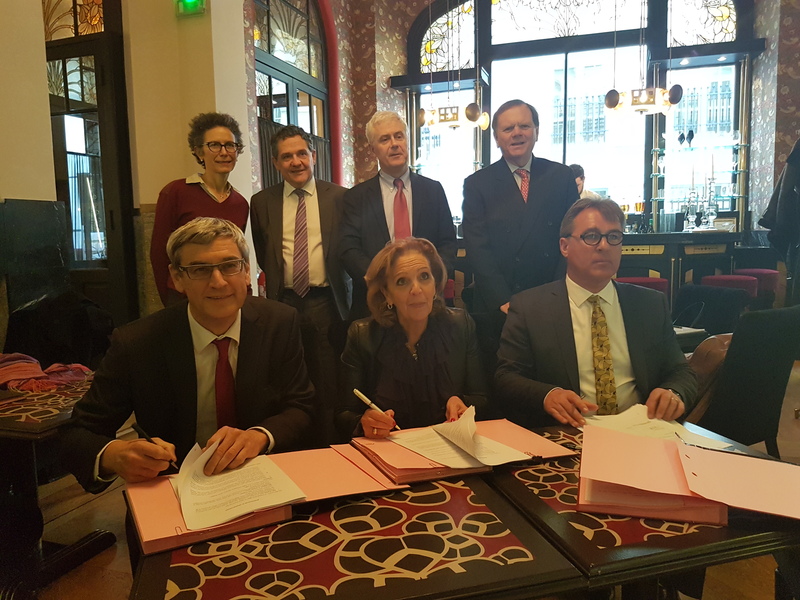 On Wednesday December 14th in Paris, an agreement was signed between Egis, an international consulting and engineering group and subsidiary of French Caisse des Dépôts et Consignations (CDC), and R20, an international non-profit organization working to develop waste management, renewable energy and energy efficiency projects. The signing took place in the presence of, from left to right: Rik Joosten, Executive Director and CEO of Egis Projects; Michèle Sabban, R20 President; and Christophe Nuttall, R20 Executive Director. Back row, from left to right: Catherine Jatteau, Deputy CEO of Egis Structures & Environment; Rémi Cunin, Deputy CEO of Egis Group; Nicolas Jachiet, Chairman and CEO of Egis Group; and Terry Tamminen, CEO of the Leonardo Di Caprio Foundation. Egis and R20 have joined forces to create a pre-investment fund specializing in sustainable waste management and the development of Waste-to-Energy projects. To learn more download the press release. Copyright © 2019, R20 Regions of Climate Action. All rights reserved. Developed with passion by Habefast communication agency. Under this capacity-building program a study tour and workshop for Romanian authorities took place in Geneva in 2016. A group of 20 municipalities benefitted from the know-how of Romanian and Swiss experts through seminars helping them to develop realistic measures for reducing GHG emissions. The Faithful Cities initiative seeks to deliver green infrastructure and other practical solutions to holy cities, as well as to encourage a collective spirit of respect for the environment based on the religious and spiritual beliefs of pilgrims and tourists. Why pilgrim cities? The influence of the faiths and religions cannot be overstated. Around 80 percent of the planet’s population professes a religious or spiritual belief. Religious organizations are the largest social network in the world, with far reaching influence in health care, education, politics and the media. Of greater importance than their influence is the simple message that religions share across borders: our responsibility to care for a shared planet and to unite for a safe future for the next generations. Around the world, pilgrim cities welcome 350 million pilgrims every year, which exert significant pressure on infrastructure, sanitation, waste management, water supplies, etc. Faithful Cities will, in collaboration with the selected cities, show how these challenges can become opportunities for healthier, more prosperous and more resilient urban environments by way of innovative and readily actionable solutions. Following the signing of the contract in December 2014, R20 worked on operational and project planning for the Dapeng New District in Shenzhen. Throughout 2015, R20 collaborated closely with the Dapeng local government on an integrated municipal solid waste management project, in partnership with a Swiss engineering company. Since the completion of data collection activities on landfills, construction and demolition waste, organic waste, as well as household waste, R20 and its partner drafted pre-feasibility studies. The studies provide an analysis of the current municipal waste situation in Dapeng, as well as for three waste infrastructure projects. R20 was the International Consultant for Delta State’s TACC Programme. This objective of this program is to provide financial support in the form of grants to green businesses, start-ups and small and medium size enterprises led by women, world-wide. Raise awareness on the challenges and opportunities of the green economy from a gender perspective, and on the solutions to be achieved through women’s empowerment and entrepreneurship. It is a tremendous opportunity for municipalities across the world to adopt sustainable, modern solutions to improve conditions for both the city and their citizens. However, because this is a new trend, there is no definitive guide for a city to become “smart.” For this reason, R20 USA is researching and analyzing solutions and case studies, and sharing them with the appropriate stakeholders with the goal of developing real projects through our global network. To assist cities, R20 USA is working with city representatives to conduct an inventory of current practices (Smart City Survey) from which they can then identify potential avenues of collaboration. This survey serves as the first step in this Smart Cities Program. In addition, R20 USA and Seventh Generation Advisors are working together to introduce their global network of partners, governments, companies, financial institutions, and academic institutions to the future of the Smart City. In 2015, R20, the Government of Mali, and Akuo Energy signed a contract to install a 50 MW solar pv power plant in Kita. Feasibility studies were conducted in 2015 and construction of the plant started in 2016. Identify an interested member of the R20 investor network, and structure a Special Purpose Vehicle (SPV), which will provide a US$ 500 million revolving loan fund to 13 cities to retrofit 1.5 million lamps. With the SPV, cities borrow money to replace lamps and repay the SPV through energy and maintenance savings.